Why struggle with short tipped circular needles when you can use EasyKnits! 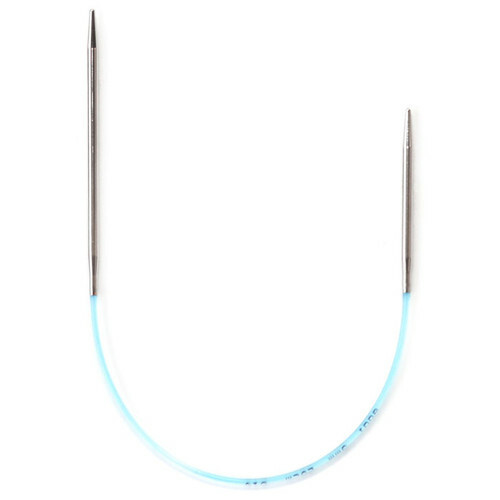 These 10” circular needles feature one short tip (1 3/4 inches) and one long tip (2 3/4 inches) to help you comfortably grasp the needle while knitting! This innovative product is sure to turn your small project into a big success! Lightweight, hollow brass tips – plated for speed and ease. Standard points for all-around use. Smooth joins eliminate snagging. Metric sizes stamped on the needle of US size 0 with a Tan cord and stamped on the light blue soft pliable cords on US sizes 1-5. Hollow, nickel plated brass tips. Q: What’s the difference between turbo and rocket tips? Q: When will you get size 2 in? Q: Are the points on the Addi Easy Knit needles like the Rocket tips or like the Turbo tips? Thanks. Q: What is the length of each needle?